Most old buildings are a part of the German or the European inspired architecture which makes them very attractive these days. The design traditions and classicism of these buildings can be seen in their facades, and it is also reflected in its interior. Above all, in the metropolitan area, old buildings are a historic testimony of demographic change which continued unabated even during the beginning of industrialization. Today's famous old housing estates were once the functional dwellings of the working class. Considering this fact, one becomes aware of why they often have peculiar ground plans, thin walls, and poor insulation. The best way to furnish an old building classily is using new designing tips. In this ideabook, you can see for yourself how our experts use modern concepts to underline the traditional architecture of old buildings. Although, this kitchen is not futuristic, but is still very modern. 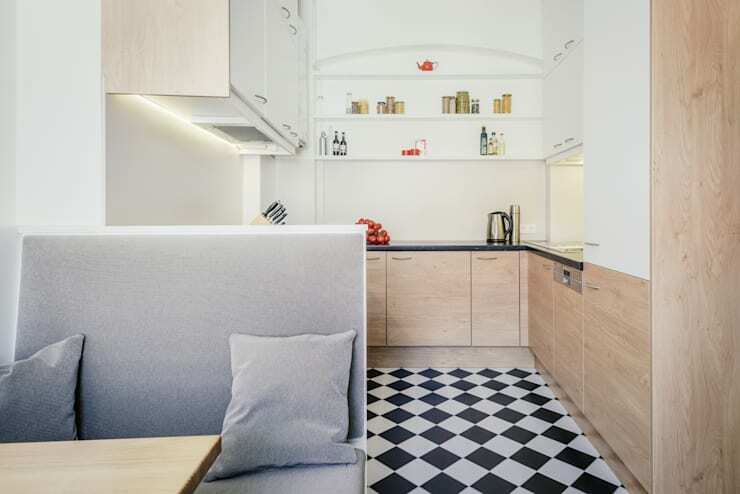 The checkerboard pattern stretches over the floor, and with its uniform geometry, it acts as a pleasant contrast to the round arch of the kitchen wall. This round arch might have been a door or a passage in the past. However, a wall was created later. 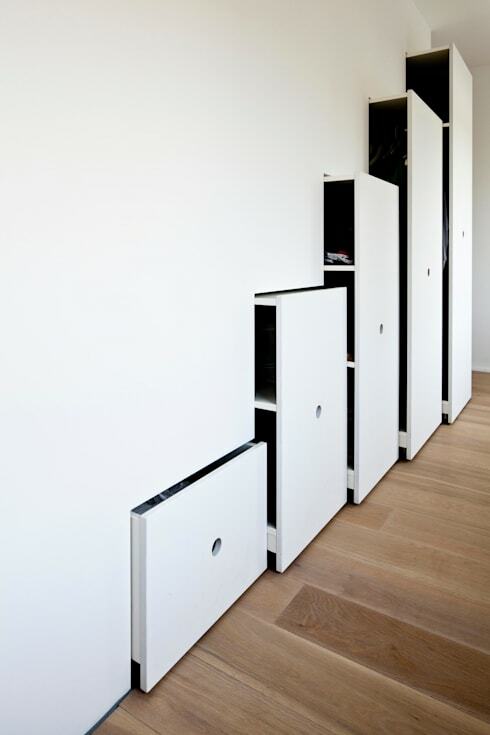 Without being filled to the depth, this wall section offers a spacious storage facility for the kitchen. The original floor plan was elegantly integrated into the contemporary ambiance of the kitchen. In the beginning, we have already mentioned that the original floor plans can make it difficult to modernize old housing estates. If the living concept benefits from removing one or the other walls, then you should consider it immediately. To furnish an old building with modern ways, you need to plan. This standard tubing room of an old apartment was decorated quite naturally. The bedroom reveals its construction style due to the graceful round arch, which is visible above the window. Also, the elegant stucco can be seen on the ceiling of the room, which is hardly more than 2,70 meter wide. To not make a small space even more cumbersome, colours should be used sparingly. Our interior expert with this photo allows us to prescribe the most dominant colour for the room. A dark purple weaves the curtains, which not only looks full and strong but above all pleasantly warm to our sense of sight as well. Dark colours at one end of the room give an optical depth to the narrow space, which we perceive in a room-enlarging manner. In particular cases, the high ceilings should also be used to one's advantage while setting up old buildings. 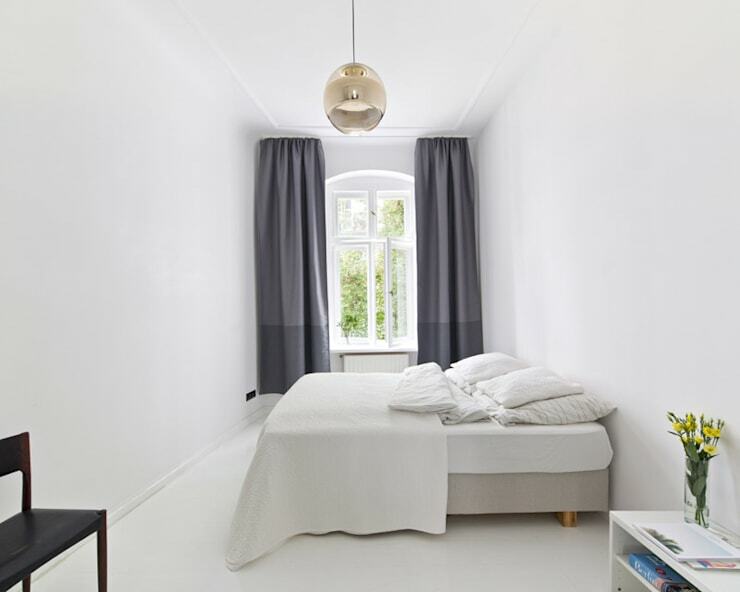 In the photo, the purple curtains are on the top of the wall to dress them down. The entire wall height is therefore emphasized and attracts the viewer's attention. Once again, this detail creates an optical illusion in this tube room, which allows you to furnish the old building. Old buildings are particularly stylish and authentic when their historical elements are maintained. 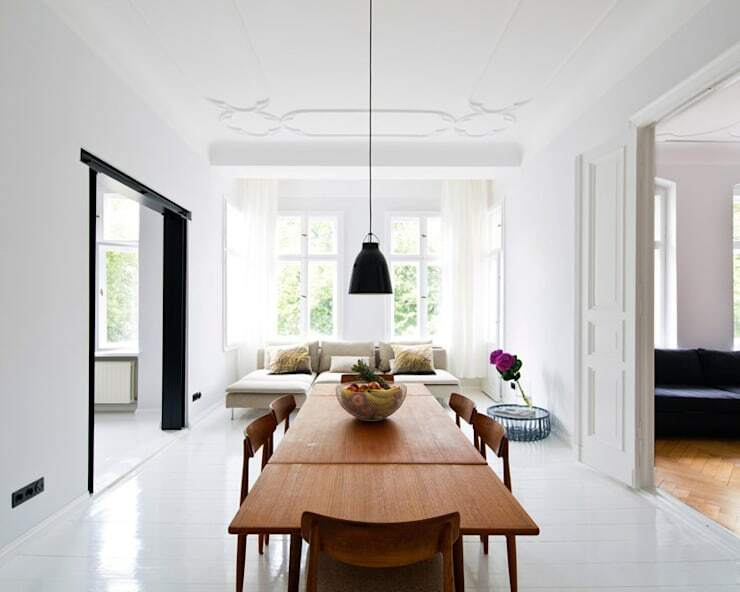 This also includes the wooden parquet floor, the stucco-covered ceiling, and the finely crafted wooden doors. Classically, these doorways cover a free wall opening with two gates. Often, after opening such doors, a spacious living space is seen, or the view of a passage room becomes evident. Owners of flats, who are planning to renovate their historic rooms, are particularly faced with the elements of such wing doors. For this purpose, areas of non-load bearing inner walls can be opened, and those big size doors can be fitted. Various door manufacturers now have models in their assortment, which perfectly correspond to the image of classic wing doors. Alternatively, it is possible to modernize old buildings by offering a breakthrough as well. Old barn doors which also consist of two sides can be used as a wide sliding door. This new design method works not only for the old buildings but also develops its charm in breach with our visual habits. It is rare nowadays to find old housing estate, which bears all the characteristics of historical architecture. In the past, these classical buildings and components were not always familiar. This is why the stucco rosettes became unrecognizable due to multiple overlapping using wooden floors or carpets. Kitchens and bathrooms were usually modified with tiles so far that the authentic impression of the old building completely disappeared. However, this flair can still be reconstructed. 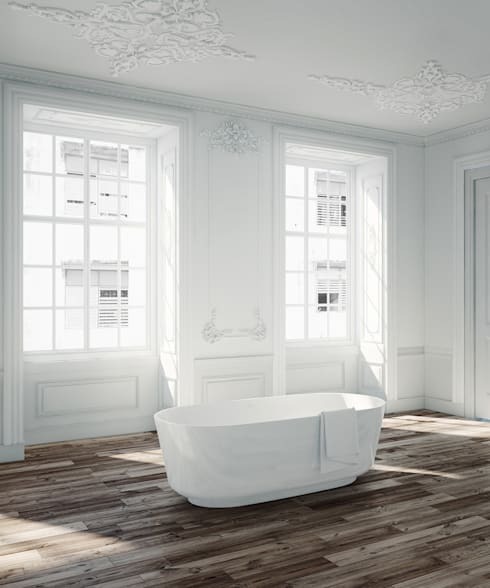 One can easily cover the floor in a parquet and walls such as room ceilings with opulent stucco. Laying original wooden floorboards in a wet room is not at all recommended. However, these days bathroom tiles are also available in wood optics, which allow historical ambiance to be reproduced authentically. The same applies to the decoration of walls and ceilings with wood paneling or stucco. These components can be purchased in specialist stores. One can even access the toolbox to produce plaster moldings and rosettes according to your design. Also, these non-tiled surfaces are applied with a special lacquer which protects them from moisture and mold. In floor plans of old apartments, practical storage space for washing machines or dishwashers were never intended. It is self-explanatory as to why it wasn't designed because this kind of equipment did not exist in those years. These houses were supplemented with the current water connections which show that old-style apartments are not only modern but are continually being updated. It is all thanks to various renovation and maintenance projects. It is, therefore, worthwhile to be active in the creation of storage space and to develop intelligent storage fixtures using facility planners or carpenters.